We are thrilled to celebrate our award winners, who were nominated by their peers, recognized for outstanding volunteer service. Your contributions provide inspiration to all of us. 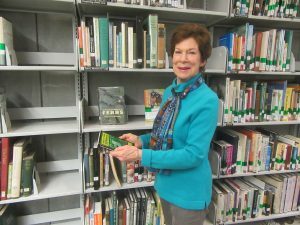 Bobbie has been a loyal supporter of VanDusen’s library since she first approached VanDusen’s librarian in 2002 with a request for collaboration with the Vancouver Rose Society. 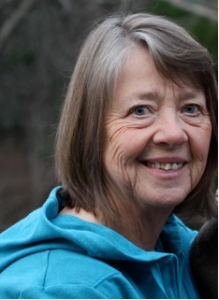 The resulting connection spurred on a longstanding relationship that would see Bobbie take on a significant role in the Library Committee, in which a dedicated group of retired librarians volunteer their time to advocate for the library in its educational role at VanDusen. In this capacity, Bobbie has generously shared vast experience and knowledge gained through her career as a library consultant. In particular, she was instrumental in her strong advocacy for the library as we prepared for automation and the big move from the Administration Building to the Visitor Centre at the end of 2010. She continues to come up with fresh ideas on how to acquire stable long-term funding for the library. Thank you, Bobbie for sharing you your farsighted vision, initiative, and creativity with the VBGA library. Brian is a strong, kind, and caring person who contributes quietly and consistently to the Docent program. He enriches the Docent study group through his leadership and he researches and presents to the group fascinating talks on a variety of plants and birds. His passion for knowledge and his willingness to share that with his fellow docents increases the team’s effectiveness in their roles. Brian has also taken on the writing and distributing of the Docent’s bi-weekly newsletter, Bits and Bites. In doing so he keeps all docents up to date on the news, seasonal changes, and comings and goings at the conservatory. He enjoys his rapport with visitors and regales all with his knowledge, good stories and fun facts gleaned from his sleuthing and observing of life in the Conservatory. Thank you, Brian for contributing your enthusiasm as a Bloedel Docent. Chris has contributed her time and expertise as a Volunteer Coordinator for the Plant Sale for the last 2 years. A role requiring countless phone calls and emails as well as supporting volunteers during the Sale. Chris tirelessly ensures that the volunteer needs of the sale are met and the volunteers are well looked after and supported. Chris has excellent computer skills and has been immensely helpful in helping the rest of the volunteer coordination team transition to a new system introduced this year. Over the winter, she selects and nurtures a wonderful selection of peonies that during the Plant Sale she sells in trees and shrubs section, sharing her love of peonies with customers. Chris also volunteers in the VanDusen library, supporting staff, volunteers, and visitors alike. 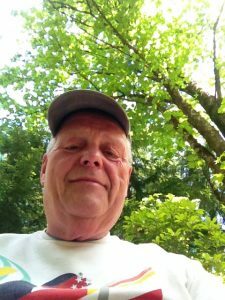 Thank you, Chris for enhancing the experience of VanDusen volunteers, Plant Sale customers, and Library visitors. Jonnet joined the VBGA about seven years ago as a School Program Leader, and took almost no time at all to jump in and lead school groups independently. Her passion for nature and teaching is clearly evident when you watch her lead a group of students through the garden. Jonnet’s ability to inspire children to learn more about their natural environment contributes greatly to our programming and is often acknowledged by teachers in the feedback. She has also demonstrated fantastic leadership skills by taking new program leaders under her wing, and happily offering them helpful advice on successful teaching methods. In addition to her amazing skills as a leader, she is dependable, thoughtful, enthusiastic, and very willing to come in when we are in need of help at the last minute for school programs, as well as assisting with day camps and other children’s programs. Thank you, Jonnet for your outstanding contribution to VBGA Education and our mission. As a recent arrival from Halifax, Ruth quickly chose to volunteer at VanDusen Gardens Visitor Services Desk, providing frontline support to our guests. Not long after, she took on the additional challenge of refreshing the hummingbird feeders through the season. Recently Ruth has joined the Today in the Garden team and with this involvement she has become a timely resource for the many VanDusen Garden visitor questions. German is Ruth’s first language and she welcomed the opportunity to translate the self-guiding tour from English to German. Her commitment and passion for VanDusen Gardens has never tired. Ruth is reliable, knowledgeable, and extremely helpful. Many members seek out Ruth and look forward to seeing her. Thank you, Ruth for enhancing the experience of our guests and supporting our birds. Margaret has contributed her strong work ethic, willingness to help others, and extraordinary leadership skills since joining the VBGA in 2015. 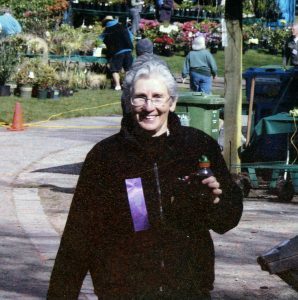 When the VanDusen Plant Sale needed a Chair, she took on the challenge and successfully directed the Sale from 2016-2017. A natural leader, she helped volunteers to fully realize their potential, supported them through any challenges that they faced, and inspired all with her careful, thoughtful leadership, always keeping the ultimate goal of having a successful Plant Sale foremost. As a Docent, she helps educate Bloedel patrons so that they can better understand the importance of the various families of flora and fauna that calls the Conservatory home. Margaret also jumps into action to fill last minute shifts, attends and contributes to meetings, all while helping to ensure an uplifting work environment in which all volunteers can be productive, and feel appreciated. Following her terms as Plant Sale Chair, Margaret, joined the team of Plant Sale Volunteer Coordinators, where she continues to demonstrate her admirable work ethic by helping recruit and support the 400 volunteers for the 2018 Plant Sale. At the same time, Margaret continues to enthusiastically participate in organizing VBGA social functions. All these things she has done while taking the Master Gardener’s course to build her knowledge of gardening in the Pacific Northwest. She is an avid gardener, very willing to share her knowledge with members of the public at clinics and at Bloedel. Thank you, Margaret contributing your talents as a leader, educator, and organizer to the VBGA community. Sue has been the Volunteer Coordinator for the Plant Sale for 15 years. Responsible for recruiting approximately 400 volunteers for each sale, Sue has touched the lives of many people. Her quiet, supportive manner has made people of all ages, ethnicity, and volunteer experience feel welcome and important to the sale and VanDusen. She always ensures that volunteers feel that they are appreciated and that they are making a difference. Sue makes sure that volunteers who are generously giving up their time to the Plant Sale have the information and training that they need to maximize their effectiveness in the time they are donating. In the last couple of years, she has built a strong team to work with her and support the sale, sharing her knowledge and understanding of the Sale with her Coordinators and mentoring them to continue into the future. If only we were all so good at succession planning! As an experienced gardener, Sue has extensive plant knowledge and supports the sale and its volunteers to better understand the role the sale has in connecting plants and people. Her superb organization skills have meant that she has expanded her mandate to supporting all aspects of the services of the Sale from traffic to building the site. On the day of the sale, Sue handles all the chaos, questions, and problems with grace and composure. Sue is well organized, a good communicator, amazingly patient and always has a happy, positive attitude. All of Sue’s efforts ensure that we have an excellent team of 400+ volunteers who come back to the Plant Sale year after year after year! Thank you, Sue for your leadership, dedication, and stewardship of our volunteer force.